Far from being an isolated aberration, the recently discovered quasi-military training camps in the Ureweras are part of a world wide movement, born more than a decade ago. Almost all of the 17 people arrested for allegedly training at those camps were Maori nationalists or anarchists. What brought highly educated, mainly pakeha anarchists to the forests of the Ureweras, to allegedly undergo firearms training with some of the country's most militant Maori radicals? 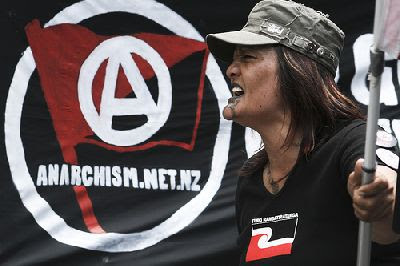 This alliance of Maori nationalists and anarchists has its origins in an international coalition of radical organisations-Peoples Global Action. In turn PGA is descended from the 1994 Zapatista uprising in Chiapas, Mexico, lead by the mysterious Subcommandante Marcos. In 1996 after the Zapatista rebellion reached a stalemate with the Mexican government, the rebels held an encuentro (encounter) of invited radical organizations from around the world. Six thousand people talked and planned for several days in the southern Mexican jungle. In August 1997, European Zapatista supporters held a Second Meeting for Humanity and Against Neo-Liberalism, in El Indiano, Spain. Radicals from around the globe attended including the militant Landless Movement of Brazilian Peasants (MST), which is linked to the crypto-communist Workers Party of Brazil and the Karnataka State Farmers Union from India, famous for burning fields of genetically modified crops. Another attendee was the Libyan trained French farmer activist and anti McDonalds campaigner, José Bové. This was the beginning of the Global Anticapitalist movement that has grown exponentially in the last decade. with delegates from 300 movements from more than 70 countries. This conference will lay down the definitive basis of the Peoples' Global Action (PGA). Its objectives are discussing and amending the manifesto of the PGA, co-ordinating decentralised protest actions all over the world during the Ministerial Conference of the WTO in May, promoting the creation of local, national, regional and topic-based platforms, and setting up the basis of an information and press network to give more international projection to the work of peoples' movements. New Zealand Maori were there from the beginning. From the PGA website, same page as above link. 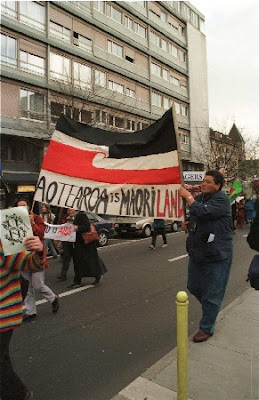 Note the prominent role played by a tiny Maori organisation, Foundation for an Independent Aotearoa. Also significant is the presence of the KMP, a well known front for the Maoist oriented Communist Party of the Philippines. Note also the role of the Cuban/communist aligned Sandinista trade union organisation. While PGA is anarchist in orientation, the old line Marxist-Leninist influence has been significant from day one. Our Maori people are awesome. Remember the Maori Battalion? Can you do a page on Te Hokowhitu a Tu... see if you can tie that into your Govt-framed spectacles. Look at the motives for our Maori tama being sent to wars created by the SETTLER GOVT and what was acheived through those wars for Maori. Being a Maori woman I'm inspired by the photos above.Wahine toa. Our champion women the world over.Keep those photos coming- they're great. They are showing nothing of underground, terrorist, tactics. The pics are showing the use of Freedom of Speech and do nothing to commit to real communism, so what point were you trying to assume there? Green Party Eco-Terrorist Apologist Sprung? Bolivian Socialists Support "Urewera 17"